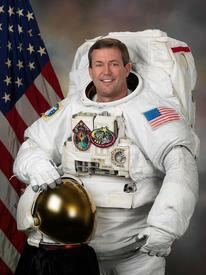 Meet NASA astronaut and Cleveland-area native, Michael J. Foreman, and hear about his exciting adventures in space. Foreman will give a video presentation on his latest shuttle flight aboard STS-129 to the International Space Station in November 2009. During the mission the crew delivered two Express Logistics Carriers to the International Space Station containing about 30,000 pounds of replacement parts for systems that provide power to the station, keep it from overheating and maintain proper orientation in space. Foreman performed two spacewalks during the mission for a total of 12 hours and 45 minutes of extravehicular activity. There will be a Q&A after his presentation. This free program is cosponsored by the Stow-Munroe Falls Public Library and the Friends of the Library.